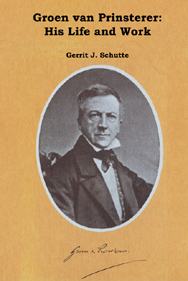 For Groen van Prinsterer, the study of history was a matter of great importance as well as practical usefulness. "In the past lies the present," as Bilderdijk had said, giving voice to a common notion of the time that was also warmly affirmed by Groen. The study of history is a means of getting to know ones own time; it is a school for everyone who wants to become familiar with the processes and structures of human affairs. It also helps one to gain insight into the power of evil and the limits to what man can do. But besides these practical lessons, the study of history in particular had religious value for Groen. History realizes Gods plan with the world. He guides earthly events to their appointed end, and along the way He does not withhold trials and hardship from his children. He also punishes those who go their own wayfor those who depart from God can expect griefs and sorrows. History, therefore, is the story of Gods guidance of and Gods involvement with humankind; it is the confirmation of the promises and threats which Revelation has attached to Gods covenant with man. 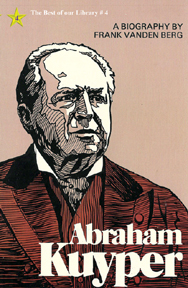 Abraham Kuyper was one of Hollands foremost leaders in politics, education, and the church from 1865 to 1917, a period of over 50 years. His influence is still felt today in his native land and in many other countries. Kuyper is unique in that he carried on parallel careers in separate major fields, both as a thinker and as a doer. He carried a sword in one hand and a trowel in the other, for he was both a builder and a battler. His followers loved him with warm, undying devotion, while his enemies hated him as they hated no one else. This biography, which is aimed at the general reader, gives us a running account of Kuypers 83 years on earth. It outlines his personal history and sketches the background whenever the scene shifts to a new phase in Kuypers many-sided career. Christian Answers for Labour Unions, Capital and Labour, The Place of Women in Society, etc. The prophetical character of Sikkel's work lies, in the first place, in his Scriptural evaluation of the socialistic ideal of society. He discerned its anti-Christian character, which aimed to make the state all powerful. This criticism remains valid over against the neo-Marxists of today. In the second place, Sikkel's prophetical spirit becomes evident in his struggle for a vision of a society in which the antithesis between capital and labour is taken away through the establishment of enterprise as an organic community. The Christian commandment to love one's neighbour is Sikkel's driving force here. This love for one's neighbour demands that social warfare be settled and peace be restored by means of consultation between capital and labour. In the third place, Sikkel's zeal for a Scriptural appreciation of labour as something which belongs to man's task as God's image bearer is of great importance. Labour is not, in the first place, a matter of wages but of fulfilling one's God-given task. The question of wages should be viewed from that perspective. Since World War II Americans have increasingly come to believe in separation of church and state, yet the majority also want prayer in the public schools and a return to traditional religious values. The authors demonstrate numerous inextricable links which bound church and state together. The human community has its common origin in creation. It shares in the fall and its need for redemption. Because it has this central, religious nature, the community of man transcends both the temporal communal and temporal social relationships. The Christian Political task is thus concerned with the inner reformation of political life itself as an aspect of the integral renewal of our whole life in obedience to the divine Word of Salvation. Essays in Honor of H. Evan Runner by colleagues such as Theodore Plantinga, Bernard Zylstra, Cornelis Veenhof, John H. Gerstner, Gordon J. Spykman, James W. Skillen, etc. on Philosophy, Theology, Politics, and Natural Science. Philosophical essays dedicated to H. Evan Runner by former students. It includes an extensive interview with H. Evan Runner by Harry Van Dyke and Albert M. Wolters. Here is a fresh approach to an old problem: How can the quest for "the peaceable kingdom" in Canada be reconciled with the demands of a modern industrially advanced society? The warning must be sounded clearly that liberal Christianity is a distortion of the Gospel, and that those who embrace it will be left spiritual destitute. There was a time when people spoke of a Christian culture. That term is now meaningless. From a biblical point of view our culture can probably be identified as Babylonian. Here man worships various gods as he builds whatever his science and technology enable him to build. Seven essays dealing with relationship of Christianity and labour in our industrial culture. Essays dealing with relationship of Christianity and labour in our industrial culture. Essays on God's Hand in History; A Christian Heroism; The Struggle for Freedom of Education; etc.